What’s good: This front brake lever protector is now compulsory in MotoGP and is designed to stop the brakes being jammed-on in the event of a collision with another rider. We’ve seen it a lot in racing, especially in slipstreaming situations and at the start of a race, when the rider behind touches the seat unit of the rider in front (like the beginning of the MotoGP in Catalunya in 2006), with disastrous consequences. I was originally hoping to try it on my S1000RR racer, but it doesn’t fit my Alpha Racing clip-ons, so I lent it to my brother Ben, whose bike has standard bars. It looks like it will get in the way, but Ben says you don’t notice it when you’re riding and the Bemsee scrutineers think it’s a good idea, too. 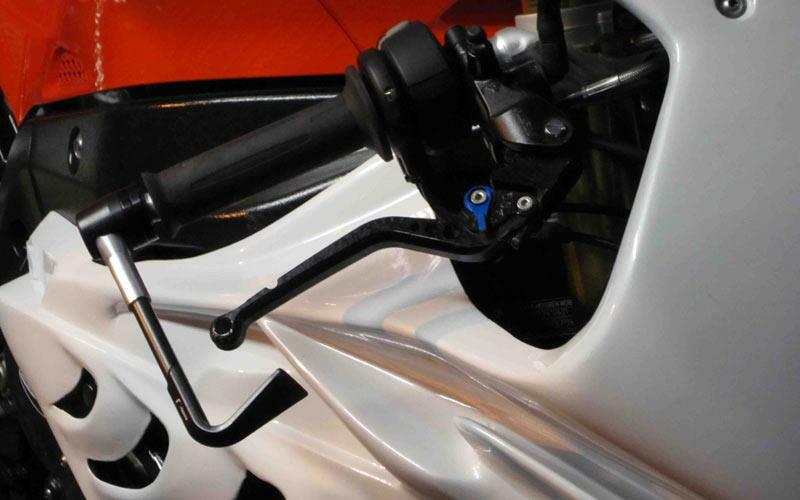 Rizoma also do a guard for the clutch lever, which isn’t as necessary, although the company does claim aerodynamic benefits. What’s not: As with any safety aid, these things always seem expensive and unnecessary (especially for cash-strapped racers) right up until the point when you need it. It could be a lifesaver.